Well known for his atmospheric landscapes, Edmund Wuerpel was the Dean of the St. Louis School of Fine Art and Dean Emeritus at Washington University. He studied in Paris with Jean Leon Gerome and James Whistler. 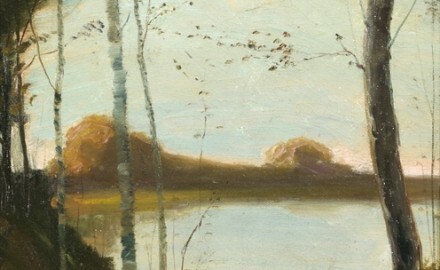 His Tonalist style of painting, unusual for a painter of his time frame living in the Midwest, was likely influenced by his friendship with James McNeill Whistler whom he met in Europe and referenced in his writings. Source: William Gerdts, “American Tonalistm: An Artistic Overview”, Essay in The Poetic Vision: American Tonalism, Spanierman Galleries, LLC, 2005.